Note: We have Engraving or Non-Engraving Choice, pls choose the suitable item.The size can vary depending on the size of your custom text. -Material: High Quality Stainless Steel. -Packaged in Elegant Gift Box and with JOVIVI Velvet Pouch! -Perfect Gift for Thanks Giving,Couples,Vanletine's Day,New Year's Gift,Ideal companion of your keys,bags,cellphones or other wonderful objects. Metal Jewelry pls avoid Alcohol,Water,Fire and so on. ❤ MATERIAL-High Polish Stainless Steel, Hypoallergenic, Lead free, tarnish & rust resistant; Stainless is beautiful, shiny and durable. ❤SIZE- lenght 3.3cm(1.3inch),width 2.2cm(0.87inch).Key Ring:25mm, Inner Dia:21mm.Round Disc:10mm. color:silver. 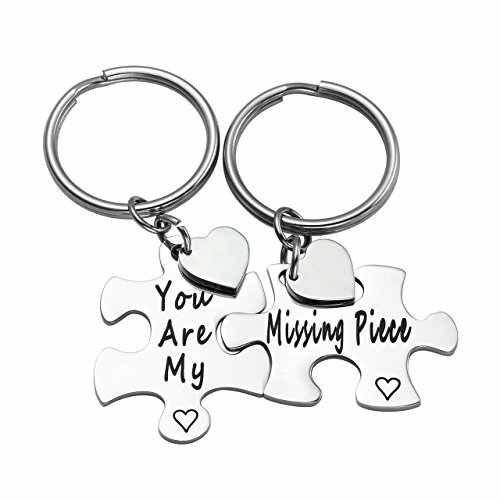 ❤COUPLE KEY CHAIN-Stainless steel "You Are My Missing Piece"with "You Fit Me Perfectly "A sweet couples set that is both simple and meaningful, One piece is not complete without the other! ❤IDEAL GIFT CHOIC-Great gift idea for any couple of any age. Great anniversary, wedding gift or even a gift for a military couple or deployed loved one. Package include :2pcsx keychain. Each order comes with Elegant Gift Box and JOVIVI Velvet Pouch!